As I stated last summer, I've got love for Press 195 in Bayside, Queens. They've got fries, they've got paninis, they've got lots of beer, and not so long ago, they got hamburgers. Few combinations in this world are better than burgers, fries, and beer. I heard about Press' new hamburger a few months back and my first chance to try it occurred with Bez during the holiday break. At first I was a little perplexed because hamburgers aren't listed on the menu yet, but our waitress let me know they do have them, they're just off the menu. I love ordering things off the menu, it makes me feel "in" and "knowledgeable". The burgers are 'pressed' just like all their other sandwiches, and come with all the fixings, including their chipotle mayo, already placed on the burger. Since I'm a control-freak, I got the mayo on the side. 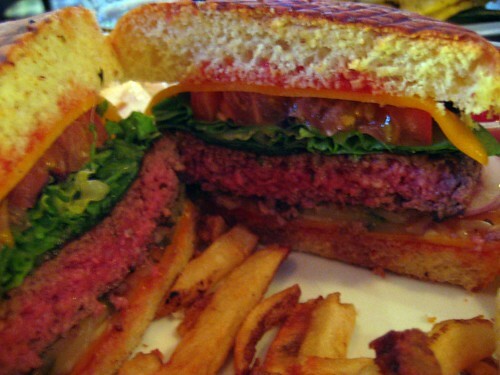 The burger was juicy, but the meat could have benefited from more seasoning. The bun also got soaked and soggy a little past 3/4ths through 1/2 (what is that? 3/8ths? ), which is not my ideal bun situation. Though it may not be voted best burger in the city, it is quite welcome in my nabe. they do have delicious sandwiches here. Never had the burger or fries, but your shot makes them both look delicious. Yum. I LOVE Press 195. I had no idea there were burgers now. I love the panini's so much though that I have a hard time straying from them. 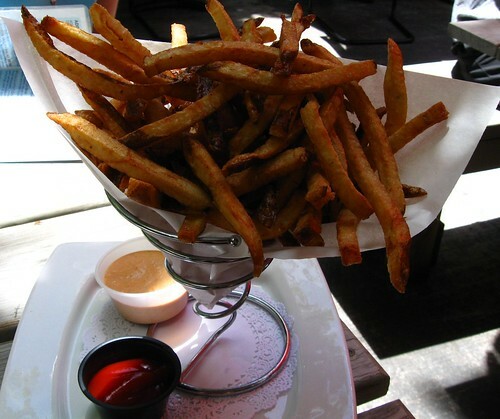 @Always:Their fries are seriously some of my favorite in the world. @Danny:The inside out toasting should be considered. I will bring it up next time I'm there. @Bianca: I've never made it to Donovan's due to personal obligations to go to Monahan's & Fitz. Horrible, I KNOW!! I will make someday! !